Oil spilled in Arctic waters would be particularly difficult to remove. Current technology has not been proved to effectively clean up oil when mixed with ice or when trapped under ice. An oil spill would have a profoundly adverse impact on the rich and complex ecosystem found nowhere else in the United States. The Arctic Ocean is home to bowhead, beluga, and gray whales; walruses; polar bears; and other magnificent marine mammals, as well as millions of migratory birds. A healthy ocean is important for these species and integral to the continuation of hunting and fishing traditions practiced by Alaska Native communities for thousands of years. 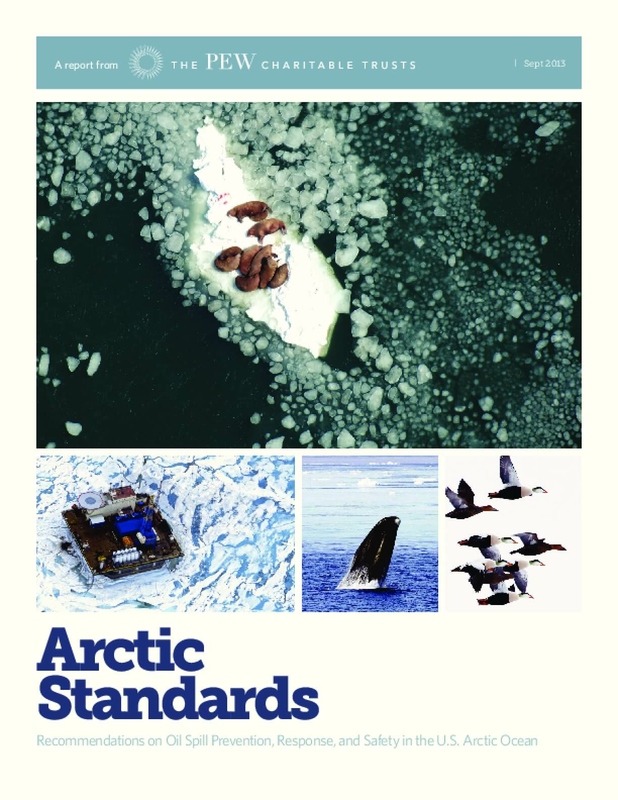 To aid the United States in its efforts to modernize Arctic technology and equipment standards, this report examines the fierce Arctic conditions in which offshore oil and gas operations could take place and then offers a summary of key recommendations for the Interior Department to consider as it develops world-class, Arctic-specific regulatory standards for these activities. Pew's recommendations call for improved technology,equipment, and procedural requirements that match the challenging conditions in the Arctic and for full public participation and transparency throughout the decision-making process. Pew is not opposed to offshore drilling, but a balance must be achieved between responsible energy development and protection of the environment.It is essential that appropriate standards be in place for safety and for oil spill prevention and response in this extreme, remote, and vulnerable ecosystem. This report recommends updating regulations to include Arctic specific requirements and codifying temporary guidance into regulation. The appendixes to this report provide substantially more detail on the report's recommendations, including technical background documentation and additional referenced materials. Please refer to the full set of appendixes for a complete set of recommendations. This report and its appendixes offer guidelines for responsible hydrocarbon development in the U.S. Arctic Ocean.